4 Bedroom End of Terrace House For Sale in Truro for Asking Price £375,000. 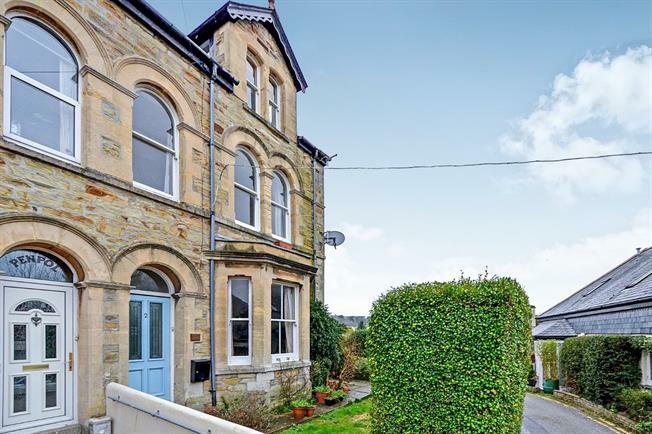 A Victorian family home situated a stones throw from the heart of the city centre. This beautifully original, spacious home comprises of entrance hall, lounge, dining room which is open plan to the kitchen on the ground floor. On the first floor there are two double bedrooms with the master bedroom offering views to the Cathedral and a family bathroom. On the second floor a further two bedrooms and a shower room with WC. There are gardens to the front and side which is southerly facing and offers clear views to the Cathedral. There is also parking for one car and a garage. Glazed front entrance door leading to a large entrance hall with original decorative floor tiling, radiator and stairs rising to the first floor. Bay window to front elevation with cathedral views, exposed timber floor, double glazed window to side, feature fireplace and radiator. Door to side leading to the garden, fireplace, tiled floor and radiator. Arch leads to the kitchen. A range of wall and base units with work surfaces over, ceramic Belfast sink with mixer tap, range style cooker with extractor hood over. Part tiling to walls, tiled floor, space for automatic washing machine and dish washer. Double glazed window ceiling mounted window and door giving access to the rear garden. Two storage cupboards and stairs rising to the second floor. Two windows to front elevation with cathedral views, exposed timber floor, fireplace and radiator. Radiator, fireplace, exposed timber floor and window to rear. With three piece suite comprising of panelled bath with shower attachment, pedestal wash hand basin, low level WC, part tiled walls and radiator. Windows to rear and side elevation. Wall mounted electric heater, fireplace, exposed timber floor and window to front with cathedral views. Wall mounted electric heater,, fireplace, exposed timber floor and window to rear. With tiled shower cubicle, pedestal wash hand basin and low level WC. Across the road from the property there is a driveway for one car leading to a garage. To the front and side of the property there are hedged gardens which are mainly laid to lawn with paved patio area and flower borders.